Remember how bitter cold it was last winter? Well SOS offers you the chance to experience tropical breezes and sun instead! This winter our planned escape is in the sunny Leeward Islands. We have planned for both 7 and 10 day boats so those of you who have limited time off can do the 7 day Saturday to Saturday trip (Feb 18 – 25) and those of you with extra time can do the Saturday to Tuesday trip (Feb 18 – 28). The Leeward Islands are part of the eastern border of the Caribbean Sea. These northern islands of the archipelago are more to leeward, so the British ships sailing from other colonies called them the Leeward Islands. 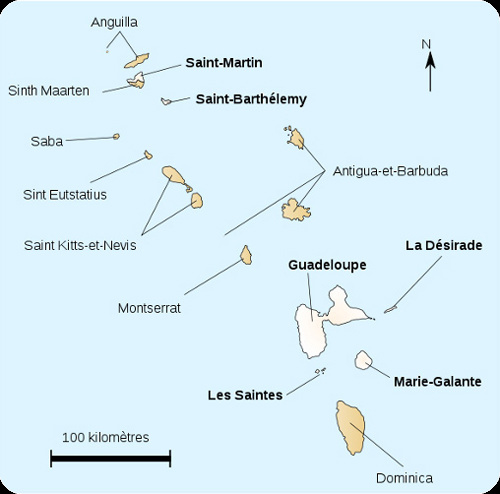 They begin in Dominica, just above Martinique, and arc gently northwest for a bit under 150 miles to include Guadeloupe, Antigua, Nevis, St. Kitts, St. Barts, Anguilla, and many others. They end near St. Martin 150 miles east of Puerto Rico. Whether the island is British, Dutch, French, or independent, each has unique characteristics ranging from the upscale and trendy to the laid-back and isolated. Some islands are mountainous remnants of ancient volcanoes carpeted with lush rain forests. Others are low-lying, flat, and rimmed with incredible white-sand beaches and coral reefs teeming with sea life made to order for an unforgettable Bareboat trip. The trade winds typically blow from the northeast to east November through March and east to southeast April through October, ranging from 10 to 25 knots. They are the power behind the north equatorial current, which usually isn’t a factor except where it intensifies around the ends of some islands. Tidal currents are weak due to the slight tidal range of about 1.5 feet. The Leeward Islands have one of the most pleasant climates in the entire Caribbean, with average year-round temperatures holding at about 80°F (26°C). This trip provides two charter opportunities.....one for 10 days starting on a Saturday and ending Tuesday, and the other for 7 days starting Saturday and ending the following Saturday. Four boats have been chartered from Moorings and 2 boats have been chartered from Sunsail. The bases are co-located to the east of St. Martin in the French part, in Captain Oliver’s Marina at Oyster Pond. All boats depart and return to St. Martin. 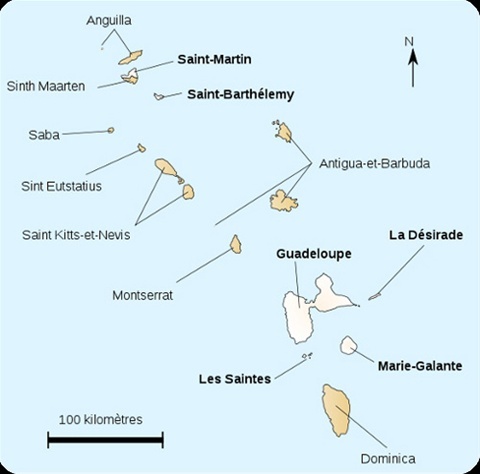 Depending on wind and weather, it may be possible to sail from St. Martin to Anguilla, Saint Barthelemy, Saba, Sint Eustatius, Saint Kitts, Nevis, Barbuda, Antigua, Montserrat, Guadeloupe, la Desirade, Iles des Saintes, Marie-Galante and Dominica.